Sometimes my mom and I like to get together on weekends and get our craft on. We pretty much stick to throw pillows but every now and then we come up with something random. A few months ago, she was redecorating her sewing room and wanted to make those decoupaged letters to spell “S E W” to hang on the wall. You have probably seen something like it on Pinterest… Anyhow, she decided that she was going to use pieces of leftover quilting material and then Modge Podge the scraps to cardboard letters. 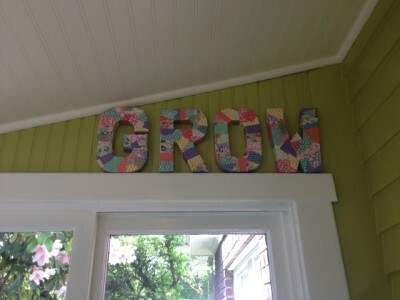 I had never used Modge Podge before or done any kind of decoupaging crafts so I chose to tag along on this endeavor and purchased my own set of cardboard letters to spell “G R O W.” I used various scrapbook papers for mine, which I just cut into strips. I will say that this project was a little messy and a perhaps a bit more difficult than I expected. The hardest part is getting the scraps of paper or fabric to stick to the cardboard before you can use the Modge Podge. We ended up using easy tack adhesive spray which made my fingers super sticky. About two letters in, I was wishing I had chosen to spell “Hi!” Once all the letters were covered, the Modge Podge part was easy. We just painted it on with a craft sponge and it gave the letters a nice finish. They turned out pretty well and I decided to put them in the mudroom where I keep some of my gardening tools. The letters actually fit the decor perfectly. As soon as I walk out the back door, I’m in full garden swing! Have any of you tried using Modge Podge for anything fun? This is super cute! And good to know, it’s harder than it looks.